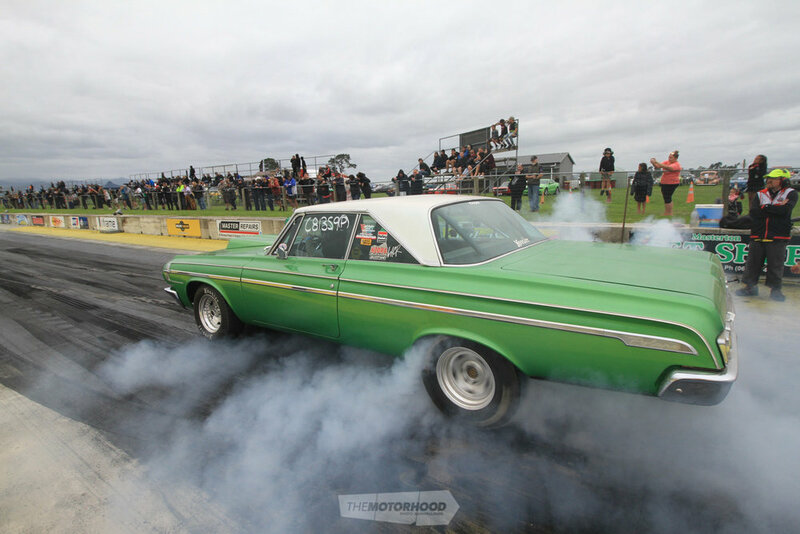 The 50th New Zealand Nationals was contested over March 17–18 at Masterton Motorplex, drawing competitors from all over the country. With a total of 217 entries it was going to be a great event, right from the get go. The weekend’s racing was split across both days, with Saturday for qualifying, which also happened to be Saint Patrick's Day, meaning there was a lot of green around, with many people spending far too much time on their outfits! The weather wasn't as hot as it had been throughout the season, but the track was still pretty sticky, with several competitors suffering start line breakages — mainly axles and diffs — leading people to believe that maybe it should have been called the Push Back Nationals, as cars were rolled backwards off the strip. In true Irish spirit, this came true, with two cars staged on the start line in reverse and both pushed by their crew. The husky won, although they did have twice the number of pushers and a much lighter car. Of the 217 entries, Super Sedan took a considerable number, with 50 in total — the biggest field in a long time. The eventual winner was Kurt Goodin in his Nova running a 9.66s pass, and he’s sure to go quicker, with plans for some major weight reduction (the car, that is) over the winter, with the stock front end getting the biff among other things. 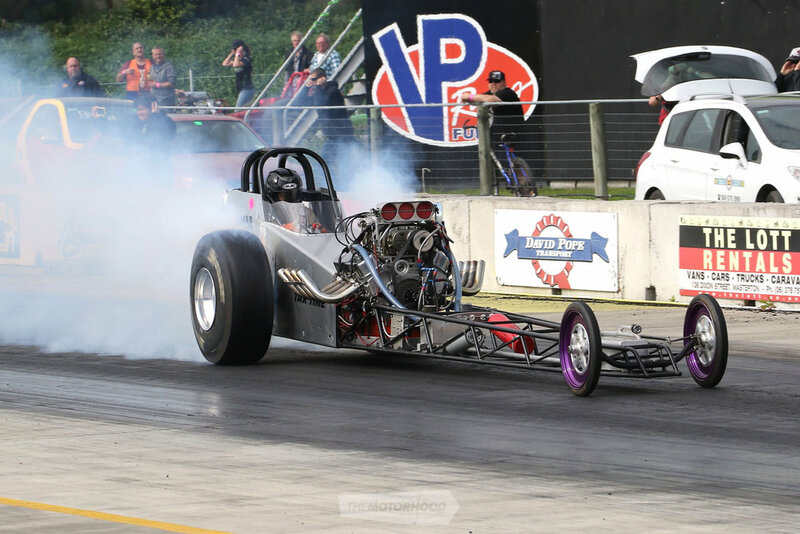 In contrast to the packed Super Sedan field, Competition had only four cars entered, the winner being the Grease Martin and Andrew Rea team in their front-engined dragster (FED), with a 7.83s at 186.35mph over the ever-so-close Arron Brattle and Pauline Lane’s 7.90s at 168mph. Supercharged Outlaws had an eight-car line up, John Shepherd leading the bunch with a stout 7.08s at 197mph — a relief after a season that he’s unlikely to rank among his best. John made it to the final against Grant Rivers, with both cars dialed in at 7.00s, but John managed a quicker reaction time of 0.028s to Rivers' 0.226s, giving him the win with a 7.05s at 191.39mph to River’s 7.07s at 190.03mph. Top Doorslammer had six entries with the Dillon/Benjes Child's Play Chev Beretta taking out the number one spot, and a new PB, running a 6.28s at 222.75mph. In the semis, Barry Plumpton laid down an impressive 6.12s at 222.95mph in his nitrous-snorting Camaro, which saw him through to the finals where he’d face off against Nigel Dixon. Dixon wasn’t having a great meeting, and that was only reinforced when plumpton took the win with a 6.42s at 215.05mph to Nigel’s slowing 8.63s at 116.29mph. 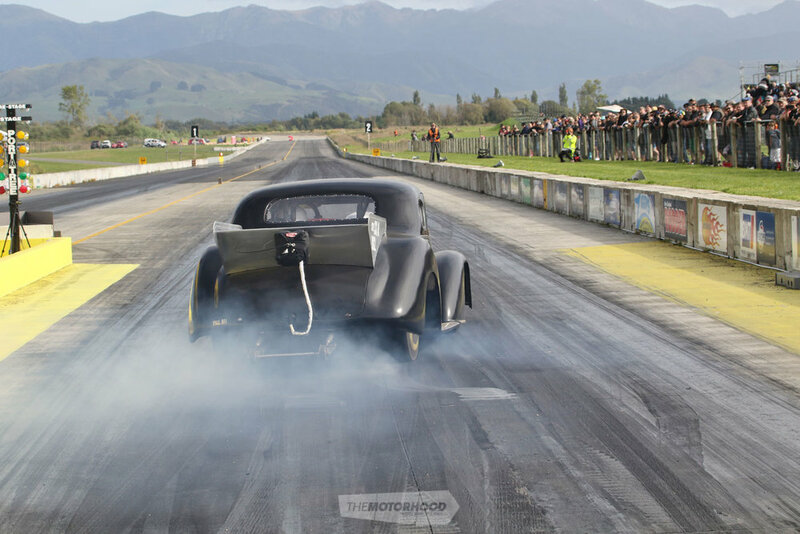 Top Alcohol's eight-car field had Wairarapa local Duane Garrett as the top qualifier, with a PB of 6.02s at 227mph. The car was very consistent all weekend long, running a whisker away from the five-second zone. Garrett had a single in the final to post a 6.07s at 228.29mph, so, although he missed out on the five-second pass, he can’t have been too unhappy with the weekend — especially considering he nabbed the lowest ET of the meeting! The talk of Super Stock was the return of Trevor Tynan’s big orange Impala. With nephew David on driving duties, the car was back out doing its signature burnouts — with massive revs, clouds, and distance — and managed to run a best of 7.35s. The eventual winner, though, was Matt Gibbons in his ’89 Daytona with a single pass of 11.39s at 121.15mph. Super Street’s 60-car field ranged from new to old cars. For the first time at the strip in a long time, Darren Ganderton in his rusty ’55 Chev proved that looks are deceiving. The paint work was hand-applied with a spray gun and sponge to create the effect, and Darren has had the car for 30 years now, currently powered a 454 backed by a TH400 and a nine-inch diff. The car’s best ET to date is a 12.2s at 111mph, although he took the win with a 12.35s at 110mph. Lindsey Stalker in his 383 Chev–powered ’76 Mazda B1600 launched like this on every run, sometimes carrying that front left wheel a good 50 meters, and his best time to date is a 9.8s at 136mph. PBs were being smashed all day long, so much so, that they had to get another board to cover them all! Running in Super Sedan, Nathan Hartley’s Mustang has come a long way this season, getting quicker and faster each meeting, and so close to the eight-second club with a best ET of 9.02s at 147.12mph. However, his season ended in a bit of an electrical fire at the top end, with Nathan having to exit the car quick-smart — the fire crew said they have never seen anybody move so fast! The problem is now fixed and the car is up for sale less motor and box, if anyone is keen to jump into it. Seen here rebuilding Mark Gapp’s Powerglide, it’s lucky Gavin Green was on hand and a bit of an expert in the transmission department. Look out for Gavin on the track next season, as he’s bought a new car from Aussie and his popular purple Monaro is going into retirement. Gary Cawthra has been working hard over the summer months on his tough XA Falcon coupe, putting in long hours to get the car to the track. While he finally made it, it wasn’t the outcome he’d been hoping for, as the car did not perform anywhere near its full potential. Luckily, he’s got all winter to sort this thing, and it’s going to fly once everything is sorted. Chris Lysaghtt’s Suzuki spent more time on its back wheel than on both together, and with a best time of 10.09s at 141mph he’s obviously been riding for a long time. 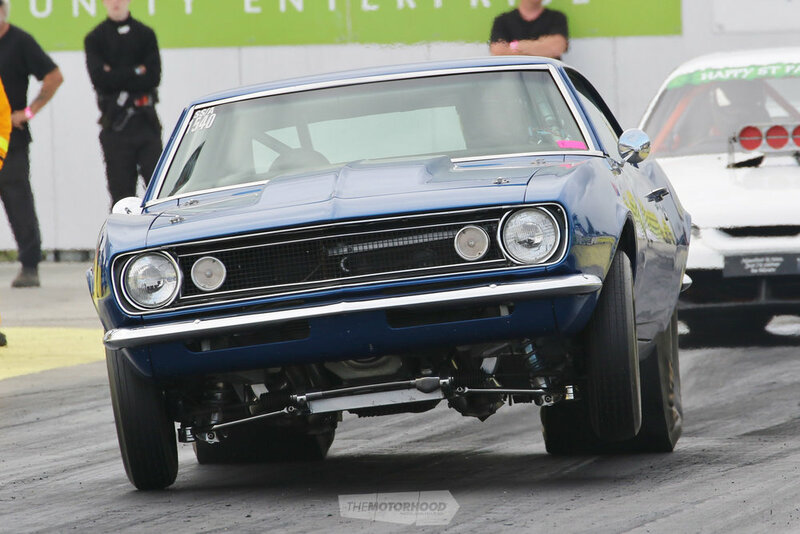 Brendon Shearing sure loves the long drive from the bottom of the South Island, as every trip this season has seen the twin-turbo big block Monaro running quicker and quicker. This time, he managed to dip into the elusive seven-second zone twice, and he reckons the car still has more in it. He’s one happy chappy, for sure! Kendal Smith’s ‘Green Go’ Topolino-bodied dragster had new tyres for this event, and wasn’t holding back in the burnout department. The long, smokey skids were incredible and definitely an event highlight. The extra grip must have helped, too, with a new PB of 7.19s at 188.17mph. Scott Miller hasn’t raced his Top Alcohol dragster in a while, but he fronted this meeting with a new combo running his first six-second pass at 6.85s at 180mph — a perfect way to get into shape for the next season. Nigel Dixon would take top honours for top speed, with a 233.35mph pass. And it was the Child’s Play DB Racecars team who netted the Best Appearing Car and Crew award. All up, it was a fantastic meeting and the best possible way to wrap up the 2017–’18 NZDRA season. We could just keep on going with this article, but have to stop somewhere. Bring on the next season, where we’re sure there will be even more records smashed on and off the track!